Creative thinking and meticulous planning are required when your firm is called upon to install two 800-ton chillers on top of a fifteen-story building in a busy downtown location. Murphy & Miller, Inc. (Chicago, Illinois) passed this logistical stress-test by innovatively employing computer-aided design and drafting (CADD) technology in a challenging air-conditioning retrofit for Carson’s Department Store in downtown Chicago. With over 80 years in the business, Murphy & Miller ranks at the top of the HVACR companies in the Midwest. The firm’s forte is retrofitting or redesigning equipment that has either deteriorated or never worked properly in the first place. The company works with customers to find more energy-efficient and less expensive ways to make their HVACR systems operate. As a result, 95% of their business is handling new HVACR problems in existing structures, as in the case of Carson’s. Carson’s Department Store’s 46-year-old HVAC system was in need of major renovation. Murphy & Miller designed a solution that salvaged as much of the existing system as possible, installing a new cooling tower and two new chillers – enough to generate 3,000 tons of cold air to cool almost 1,000,000 square feet of happy shoppers. The project called for installing the 800-ton chillers, which cost nearly $200,000 each, on the roof of the 70-year-old, 15-story building. 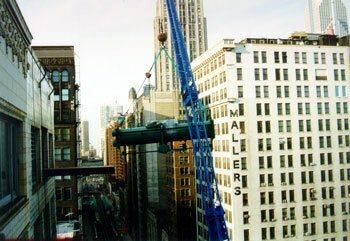 Compounding the usual installation problems was Carson’s location on the high-traffic corner of Wabash and Monroe, right in the heart of Chicago. “Due to the cost and size of the chillers, as well as the busy downtown location, the way we placed these units onto the building was critical. Any mistakes during installation could be both dangerous and costly,” states Chuck Gagnon, Murphy and Miller’s Vice President, Operations. 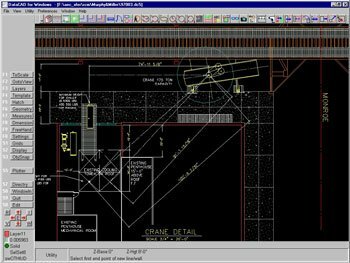 Murphy & Miller also used CADD to model the inside of the mechanical room as well as all of the pipe work; then he created a plan layout of the entire operation. “The plan layout was critical to the operation, and it had to be as detailed as possible. Once we had the plan layout ready, it gave us a game plan on what we had to do, especially so near the CTA (Chicago Transit Authority) tracks,” Macias said. The next step was to take the plan view and organize a run-through planning session with the crane operators. Every movement was planned precisely, and everyone understood where all the good and bad angles lay. With the plan in place and the layout completely mapped, the placement crew was ready to go to work. 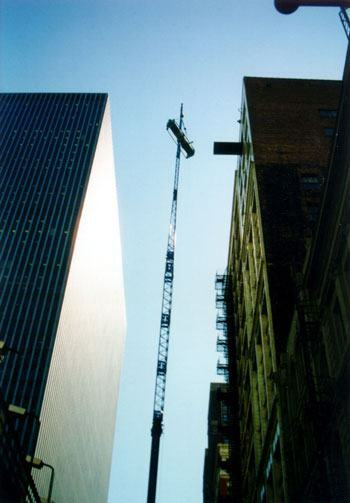 Working on weekends to avoid traffic delays as much as possible, the crew hauled the chillers to the roof. 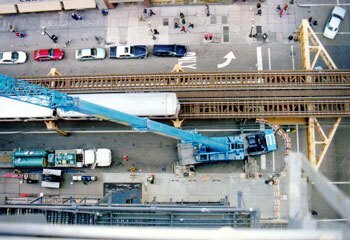 The movement and clearances were so tight that the crane had to block the CTA tracks repeatedly, yet because of planning and communication with the transit authority, not a single train was delayed. Because the layout was so accurate and the planning so thorough, the ballet of train and crane was perfectly timed. “The entire operation proceeded fabulously. The building owner was very impressed,” Macias said. The best laid plans often go awry, but even with a double load of 800-ton chillers, tight quarters, elevated commuter rails, and heavy traffic on the streets, this was one plan that would not falter, thanks to the latest CADD technology. No wonder the owner was impressed.